Create a safe and fun environment in our community for children to love participating in the sports of football and cheer leading. The North Suburban Youth Football League (NSYFL) has produced some of the finest youth football prospects over the last 50 years in the Kansas City area. The league is governed by a Board of Directors elected each year by the organizations in the league. The league's history spans over 50 years. All coaches are required to attend an annual coaching clinic. Over half of the league's 67 head coaches have more than 10 years of experience with some having over 25 years of coaching experience. The NSYFL is Grade based not Weight qualified, although there are extreme upper weight limits in each grade grouping. This prevents reasonably larger, younger kids from being forced to play against boys several years older than them like other youth leagues. Most teams field both Varsity and Junior Varsity squads within each age group. This allows newer and younger boys to gain considerable playing time in conditions more compatible with their ability. Most teams have their own home field complex and operate Field Committees, Concession/Novelty Stands and Press Boxes with music/announcers. This adds a real "High School" type atmosphere which allows teams to take pride in defending their "Home Field" during the games. This is truly a unique feature to the NSYFL and differs greatly from other youth leagues that host all the games in one location. There are many parent volunteer activities including, organizing club social events and generating positive public relations and partnerships which are then needed to support a teams "HOME FIELD". The officials for each game are provided by the NSYFL and are sanctioned by the Missouri High School Athletic Association. Most officials also do college and high school officiating as well. 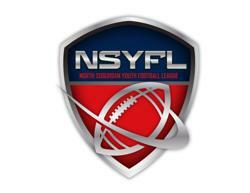 Who is eligible to play in the NSYFL? Do you have to live in the Northland to play? Does it matter what school I attend? All players are eligible regardless of where they live or what school they attend. The league is not school or region affiliated. All games are primarily played in the Northland area; however the league is open to players and teams from all over the Kansas City Area. In recent years, players, individual teams and full organizations have come from as far away as Olathe, Lee's Summit, Raytown, Downtown Kansas City, and St. Joe to participate in the league. The NSYFL is comprised of 4 divisions: Kindergarten - 2nd Grade Flag, 10U Tackle, 12U Tackle, and 14U Tackle. Each division has age and weight restrictions which determine what division a player is allowed to participate in. Each team will have approximately 8 Varsity Games and 7 Junior Varsity games. Varsity games are typically held on Saturday and the Junior Varsity games on one of the following Monday through Thursday Nights. All players dress for and may participate in the Varsity games. The Junior Varsity game is held for the developing players who did not get as much playing time in the Varsity game. This insures plenty of playing time for all players. Most teams’ practices and games are located in the Northland in either Clay, Platte or Leavenworth Counties. Each team does have their own "HOME FIELD". ©2019 North Suburban Youth Football League / SportsEngine. All Rights Reserved.